Millfield is one of the leading independent schools in the UK. Founded in 1935, the school has transformed itself from a mid-sized school into the largest co-educational boarding school in the UK. The school has 1700 pupils and over 600 employees. The library was built in the late 1970s which explains the original lighting, comprising surface-mounted T12 fluorescent luminaires sunk in concrete ‘pots’ with pine louvres. 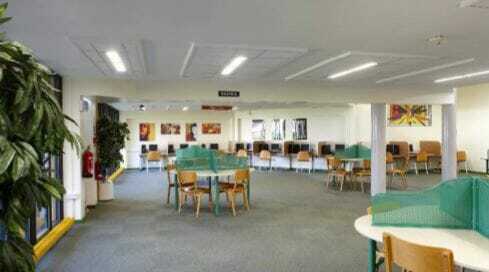 The initial school trial of LED lighting proved very successful with the 123 fluorescent fittings in the library now having been replaced with 70 x (300×1200) Phillips CoreLine LED luminaires. Light level readings before and after the upgrade show that light levels have improved considerably. For example, illuminance levels on the middle floor computer area have increased from 124 lux to 724 lux, with similar results on the lower floor. The installed electrical load has been significantly reduced from over 27kW to just 2.94kW. Ongoing maintenance costs will also be reduced and the fact that Millfield school estates department was able to carry out the installation work reduced the project costs considerably, giving an even faster return on investment. “The light quality is much better and the improved colour rendering has enhanced the décor of the spaces.